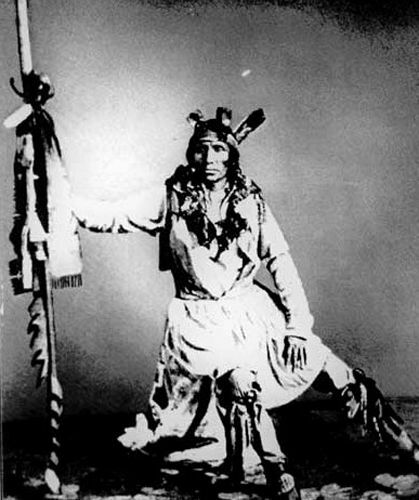 Chief Little Crow was the eldest son of Cetanwakuwa (Charging Hawk). It was on account of his father’s name, mistranslated Crow, that he was called by the whites “Little Crow.” His real name was Taoyateduta, His Red People. Two kegs of whiskey were bought, and all the men of the tribe invited to a feast. It was planned to pick some sort of quarrel when all were drunk, and in the confusion, Little Crow was to be murdered. The plot went smoothly until the last instant when a young brave saved the intended victim by knocking the gun aside with his hatchet, so that the shot went wild. However, it broke his right arm, which remained crooked all his life. The friends of the young chieftain hastily withdrew, avoiding a general fight; and later the council of the Kaposias condemned the two brothers, both of whom were executed, leaving him in undisputed possession. Such was the opening of a stormy career. Little Crow’s mother had been a chief’s daughter, celebrated for her beauty and spirit, and it is said that she used to plunge him into the lake through a hole in the ice, rubbing him afterward with snow, to strengthen his nerves, and that she would remain with him alone in the deep woods for days at a time, so that he might know that solitude is good, and not fear to be alone with nature. At a very early age, she made a feast for her boy and announced that he would fast two days. This is what might be called a formal presentation to the spirit or God. She greatly desired him to become a worthy leader according to the ideas of her people. It appears that she left her husband when he took a second wife and lived with her own band till her death. She did not marry again. Little Crow was an intensely ambitious man and without physical fear. He was always in perfect training and early acquired the art of warfare of the Indian type. It is told of him that when he was about ten years old, he engaged with other boys in a sham battle on the shore of a lake near St. Paul. Both sides were encamped at a little distance from one another, and the rule was that the enemy must be surprised, otherwise the attack would be considered a failure. One must come within so many paces undiscovered in order to be counted successful. Our hero had a favorite dog which, at his earnest request, was allowed to take part in the game, and as a scout, he entered the enemy camp unseen, by the help of his dog. When the United States Government went into the business of acquiring territory from the Indians so that the flood of western settlement might not be checked, commissions were sent out to negotiate treaties, and in case of failure, it often happened that a delegation of leading men of the tribe were invited to Washington. At that period, these visiting chiefs, attired in all the splendor of their costumes of the ceremony, were treated like ambassadors from foreign countries. The tall and handsome Ojibway now rose and straightened his superb form to utter one of the clearest and longest wolf howls that were ever heard in Washington, and at its close came a tremendous burst of war whoops that fairly rent the air, and no doubt electrified the officials there present. On one occasion Little Crow was invited by the commander of Fort Ridgeley, Minnesota, to call at the fort. 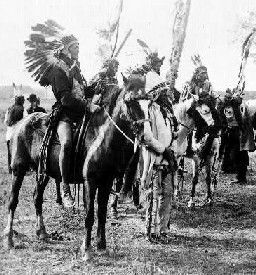 On his way back, in company with a half-breed named Ross and the interpreter Mitchell, he was ambushed by a party of Ojibway and again wounded in the same arm that had been broken in his attempted assassination. His companion Ross was killed, but he managed to hold the war party at bay until help came and thus saved his life.